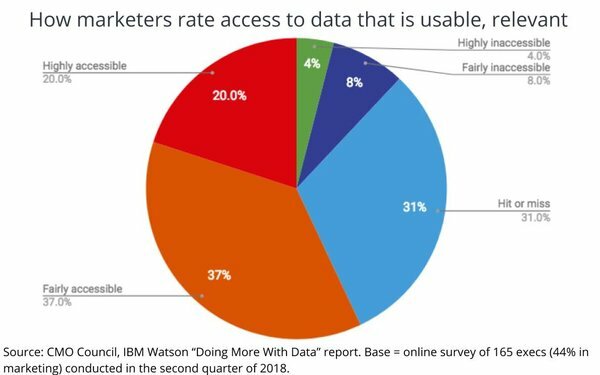 Data may be the oil of the new marketing economy, but according to top executives at big marketing organizations, it comes with a hidden cost: time. 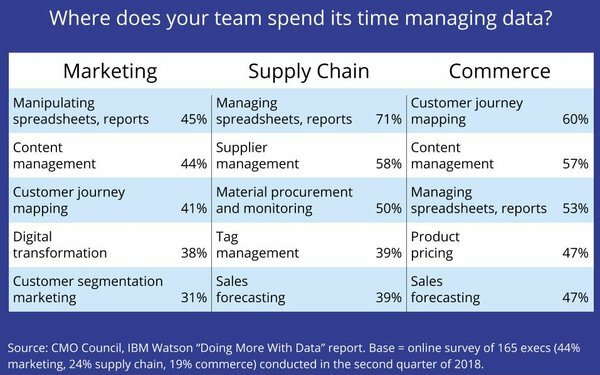 Forty-five percent of executives surveyed recently by the CMO Council and IBM Watson say they don’t have enough time to process the consumer data they have at their disposal. That’s nearly as many respondents as those who cite the lack of talent (48%) and the lack of tools (53%) necessary to effectively manage their consumer data. “Consider what takes the most time across each function,” reads a 107-page report with highlights of those findings. “For many teams, time is being spent — and perhaps wasted in some cases — manipulating and managing spreadsheets and reports. The findings of the report, “Doing More With Data,” are based on online survey conducted with 165 executives involved in marketing (44%), supply chain (24%) and commerce (19%), conducted during the second quarter of 2018. In terms of where the greatest time drains are involved, the responses varied depending on the area of enterprise focus. Among marketers, “manipulating spreadsheets and reports” was the No. 1 strain on time, cited by 45% of those respondents. “Content management” was No. 2 (44%). 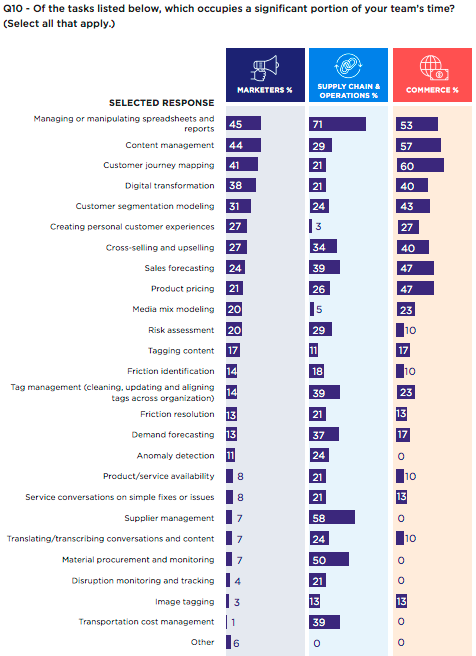 Interestingly “content management” was also the second-greatest use of time (57%) for executives involved in commerce, just behind “customer journey mapping” (60%). Ironically, the report concludes that it could be the “misdirection of both tools and talent that could be adding to the issue of time.